This is another look at my "Autumn Cliffs mountain with the camera moved in very close. 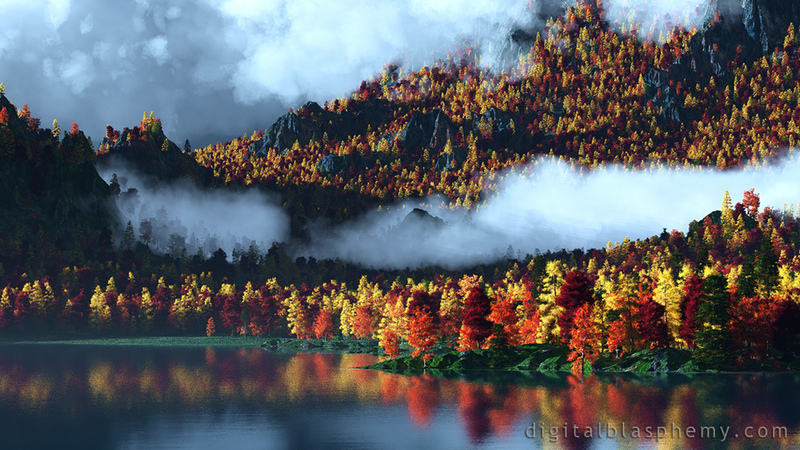 I've changed the reddish morning glow to a more bluish tone and I have shortened all of the evergreens by half. I worked on this scene on Bucephalus during breaks from the pumpkin patch. Is this available in a poster? I looked in your store and didn't see it...I would love to have a print of this to frame. It's stunning. Many people are using their monitors vertical please start making 9:16 1080x1920 portrait resolution. It's a great picture but if i can't get PORTRAIT RESOLUTION then I might have to let my account run out. It's sad too because i have loved this website since it began. Hi Ryan. Ant chance you might consider rendering your images for compatibility with iPad Pro? Cool perspective; the lake reflections are nice. The distant trees seem a bit too colorful to be believable; atmospheric fading should have muted their colors. This is the best of the bunch, although I like all of the autumn images this year. Your seasonal renders are always my favorites. Thanks for all your hard work, Ryan! I liked the original, but you have convinced me this is the better. I love the bold colors of this render better. I have actually been in New England (Vermont-New Hampshire-Maine) during the changing of the colors of the leaves. You hit it smack dead on! This is one of my favorites from your site. I wish I lived somewhere like this! 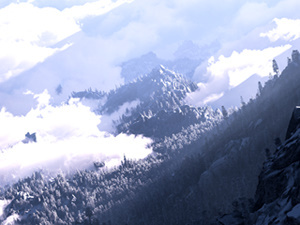 This scenery render is breathtaking! Great job Ryan! You took great and made it awesome! As the saying goes "art is never finished..."
Never be afraid to come back and look to add to what you have already done! No 1680 x 1050?? I've run across a couple of newer renders without this resolution. Is this screen resolution size becoming obsolete?? Looks amazing (even though the water is a little bit grainy to me), but makes me want a triple-screen setup even more! "I'd swear this was a real place"
If I did not know that this was a rendered image I would swear that this scene was located in the Appalachian Mountains of North Carolina. This is an amazing wallpaper. Really nice. Sadly it's spring in Australia. This is pretty cool artwork. Not surprised though Ryan. Like the colours and I like the mist effect. It's so calm you can tell it's going to be a lovely day. I love this one! Beautiful fall colors plus the fog capture the feeling of autumn. Can't wait for the multiscreen version! This version make a whole lot more sense! This one actually bothers me...it's like an uncanny valley effect (I've gotten that a lot with your newer stuff). My first thought was that the trees are too neon...yet fall colors are often like that. I just want to soften the image a bit. This is an awesome render. There is a huge hole though without multi-screen versions. These are clearly missing and need to be rendered while its still Fall. Agreed that this deserves its own entry somewhere, not quite so tucked away. Personally, I much prefer the colour balance in this version; the previous ones seemed too artificially red in the sky. Here, the cooler/bluer ambience complements the trees better. This deserves is's on spot in the gallery. The lighting and clouds make it a very different pic from the original. Stunning. I love this render. Its vivid and colorful. Any chance you are going to make a dual screen version of this?